Miles Davis Project Band: Concert Videos Online Now! The concert promoting wing of Nathan Hassall Music aims to bring truly innovative and entertaining events to the London concert going public. 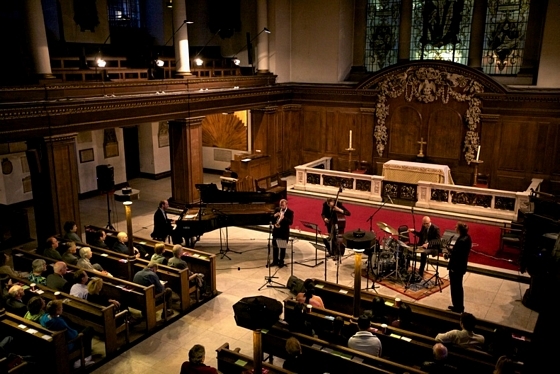 Recorded by the acclaimed film maker Amir Adhamy at the concert “The Bebop Years, 1945-49” (St. James’s Piccadilly, London, 10th June 2011) these videos aim to give you a taste of the Miles Davis Project Band’s themed concerts dedicated to the legacy of legendary jazz trumpeter. We hope you enjoy watching what we think are stunning high quality videos of these two classic jazz numbers (they were filmed in HD no less!!) and remember if you want to be kept up to date with news and special offers for our concerts remember to sign up to our newsletter. “the excellent trumpet player, Joe Auckland…"
"Joe is a really good player"
"Thus Hassall's solos managed to suggest Coltrane on the way to the wilder and more ritualistic excursions of his later work..."
“There's nothing to compare with the sensation of hearing music from various chapters in the story of jazz played live. Sensitive repertory performances by gifted young players can teach us just as much about the music as the records that collectors treasure, as the concert experience is - in my opinion - the best way to hear every kind of music."